Marshall President Stephen J. Kopp, left, and Kanawha Valley CTC President Joseph Badgley sign 2+2 Articulation Agreements today in Dr. Kopp’s office on MU’s Huntington campus. Photo by Liu Yang/Marshall University. HUNTINGTON, W.Va. – Marshall University entered into an agreement today that allows business majors who have earned associate degrees from Kanawha Valley Community and Technical College to seamlessly transfer those credits to Marshall in pursuit of bachelor’s degrees, according to Dr. Rudy Pauley, associate vice president for Outreach and Continuing Studies. 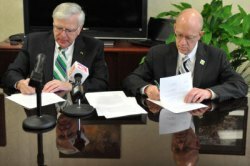 Marshall University President Stephen J. Kopp and Kanawha Valley CTC President Joseph Badgley signed 2+2 Articulation Agreements today to benefit students in the fields of Accounting, Finance, Management, Management Information Systems, and Marketing. The signing took place in Old Main on Marshall’s Huntington campus. President Kopp said he is “quite pleased” to provide these degree options to students from Kanawha Valley CTC. According to the official agreement, the deans of both programs will continually monitor the curriculum at both institutions to ensure consistency and program quality. Students who hold an A.A.S. degree at Kanawha Valley will earn a B.B.A. from Marshall by fulfilling their final two years of coursework on the Huntington campus. Once at Marshall, transfer students are a part of the Marshall University College of Business. President Badgley said the Business Studies faculty at Kanawha Valley CTC, especially Dean Megan Lorenz, has developed a very positive working relationship with their counterparts at Marshall University. He said both groups are dedicated to providing transfer students the opportunity to succeed and pursue their education beyond completion of the associate’s degree. Badgley added that this agreement provides benefit to both institutions.